It’s impossible to cook a Julia Child recipe without summoning her in some way. From the first moment, you can feel her peering over your shoulder – self-assured, encouraging, generous. Once you’ve started, you’ll do anything to keep her there, so I’m always on the look-out for Julia Child cookbooks. Just before my last birthday, I found a second-hand copy of From Julia Child’s Kitchen that included this recipe for les Madeleines de Commercy. When the Cooking Channel invited bloggers to celebrate her upcoming birthday by posting about one of her recipes, I knew which one I wanted to make. This recipe is everything I love about Julia Child (I’m sorry but I just can’t call her Julia). Well before Madeleines were readily available, wrapped in plastic and holding their breath at any given Starbucks, she was trying to find her own way back to the perfect Proustian Madeleine, part cake, part cookie and made to crumble in tea. 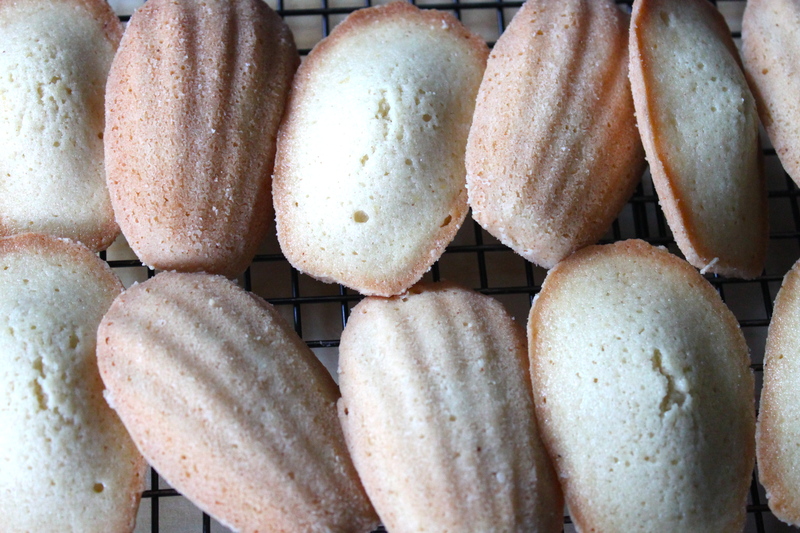 After featuring Madeleines à la génoise on her show, she responded to a viewers desire to see the heavier Madeleines, with the hump in the middle, made famous by the bakers of Commercy (and of course Marcel Proust) with this recipe. Based on Pierre Lacam’s Le Nouveau Mémorial de la Pâtisserie et des Glaces, the batter rests for an hour to allow the butter to congeal so that the hump will form during baking. I’d made them once before and tried to adapt them to my Kitchen Aid mixer, an unnecessary step. Julia Child had seen the electric mixer and the beaters, if they were called for, she would have told us. Limiting myself to a mixing bowl and wooden spoon was oddly liberating, a reminder that modern conveniences aren’t always convenient. I could have even done without the specialized Madeleine pans with the shell-shaped depressions. Her husband, Paul, believed early cooks used cockle shells and they tested it with ribbed scallop shells that worked. As they were baking, I could imagine whipping up a batch on a dessert island (provided it was stocked with unbleached, all-purposed flour as well). Rested, scooped and baking, they were at the halfway point when I started to get nervous. The batter had spread evenly to fill the shells but there were no humps in sight. With only a couple of minutes left, they started to emerge and I breathed a sigh of relief. Unmolded and wobbling back and forth like newborns, I had the same question as Julia Child. Wondering why they should be baked in shell-shaped molds if they’re served hump side up, hiding the pretty ridges that were formed, she regrets “that only the ancient bakers of Commercy can say, if they could but mumble to us from their tombs.” For once, she didn’t have the answer, but it was comforting to know that even Julia Child looked for ghosts in her kitchen. Original recipe found in From Julia Child’s Kitchen by Julia Child. Notes: When cool, they can also be wrapped and frozen for later. I have every book Julia has written and I adored her then and now. You did a beautiful job on these madeleins. I think you’ve made Julia Child proud! 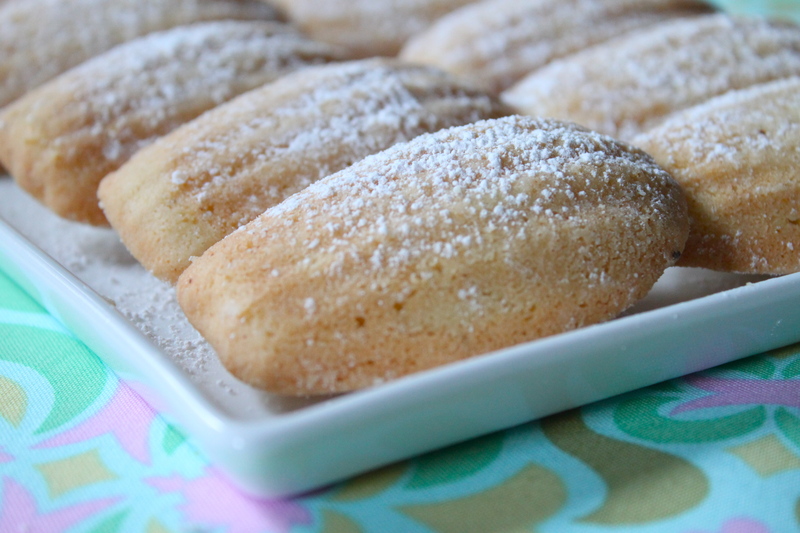 I absolutely love madelines – the perfect blend of cake and cookies and cake. And you did these right. They look perfect. My favorite favorite! Today I ate fake Madeleines from Starbucks! I would pay big bukcs for urs! The image is beautiful too! If you’re at Starbucks they’re not a bad choice! I am actually making this recipe now…they are in the oven. I did not have the time to let it rest to achieve the famous ‘hump’ so we’ll see in a moment whether they’ll do it! But it’s for a class of 6 year olds taking French so…I think just the fact it’s a treat will be enough! Ahh…and the hump worked. I must have had just enough time resting that it pulled together enough. Thanks for the recipe! That’s great! I hope they enjoy them! I would do anything to have some of these babies now!!! Mmmmmmm! I try to let it rest in the fridge at least one hour. I’m so happy the turned out well for you! Anyway, I just put a pinch in for good measure. Thank you for catching that – it is a pinch of salt! So happy you liked them. They’re definitely a little darker and richer than other madeleines but it’s a nice change. I am so glad to have come across your article. I’m a fairly good baker that’s why when I decided do a batch of madeleines last weekend and was unsuccesful I was really disappointed at myself. 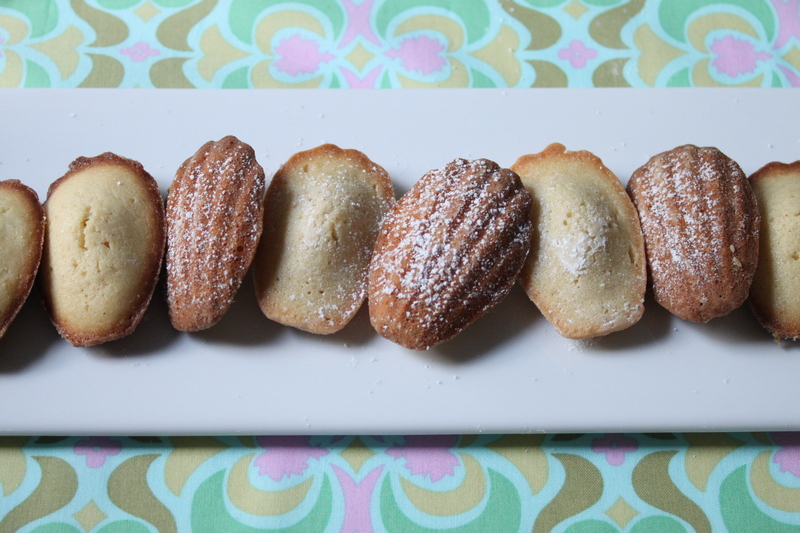 Upon reading your article I’ve gained a new light on making madeleines and will gladly try it again. Thank you. That’s great to hear! Good luck and please let me know how they come out! Help! I tried it again last night and unfortunately, it did not come out as I hoped. 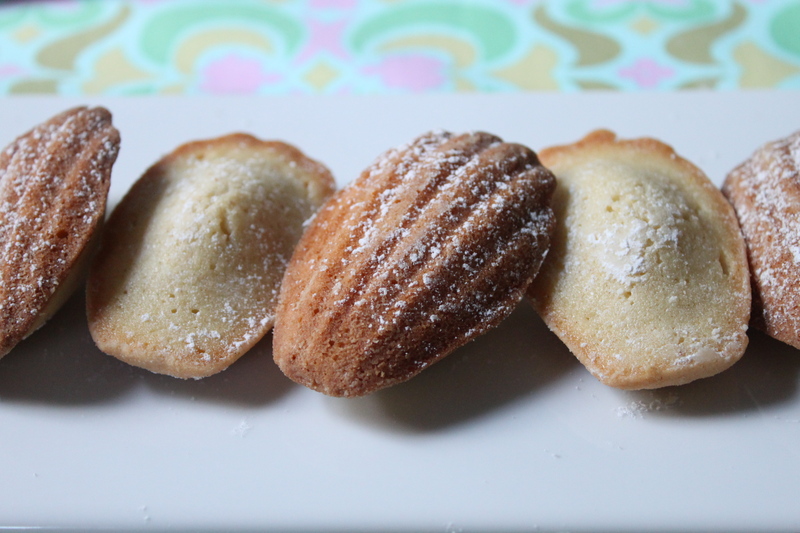 Firstly, it didn’t have the hump, taste-wise is good, texture is definitely off, it did not have the cookie effect that I get with other madeleines. I might have missed something but I have no clue what it is. After reading the recipe again and the comments, I noticed that I only set it aside for an hour at the kitchen counter but not in the fridge, is that a big deal? Anyway, I’m not losing hope I will try it again this weekend. I made one batch of this recipe and they were a bit dense. But since I have sworn by Julia Child recipes in the past i decided it was worth another shot, this time I added more egg, probably 2 3/4 eggs total, and that helped get a more creamy batter started. It might just be that the eggs were not quite ‘large’ enough. I was also nervous that the eggs and sugar weren’t beaten together first but they were still spongy and delicious inside. I also added about 3/4 T of dried lavendar for fun and it was a nice surprise. Keeping warm baking, furnace will be fixed tomorrow ! 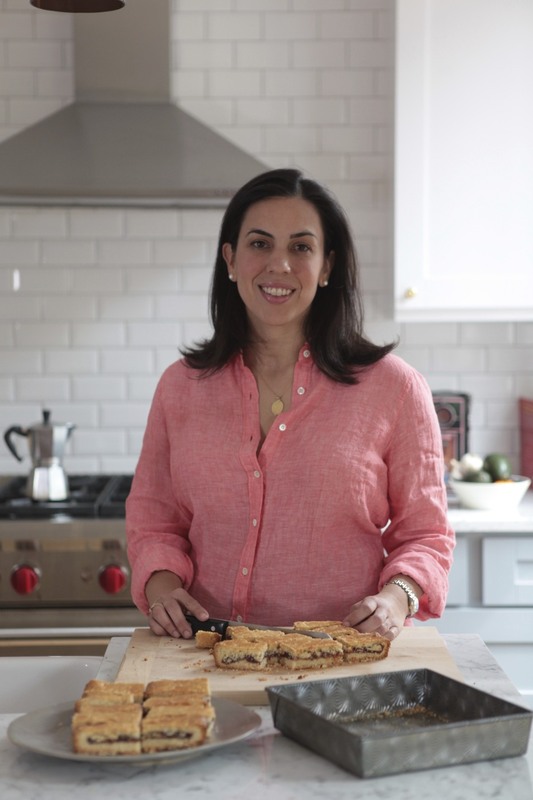 Hi – looking forward to trying this recipe! What sort of madeleine pan do you use…I’m torn between the tin and the nonstick. Thoughts? I prefer my tin madeleine pan but then it’s better quality than the non-stick one I have which is dark and browns them too quickly. Let me know how it works for you! Thank you for posting this, you write beautifully! I’ve just put mine in the oven. Fingers crossed! I bought my madeleine pan at William Sonoma. The lady that served us had studied pastry in France. Anyway, she suggested putting a baking sheet in the oven (while preheating) on which to set the madeleine pan. This is supposed to help even out the heat, and prevent the underside from over cooking. Thank you and thanks for passing on the tip! I’ll definitely have to try that next time. Hope they turned out well! Excited to make these with my daughter who is named Madeleine! I have a question–what does it mean to “stir the rest of the butter over cold water”? Like, put the mixing bowl into the sink filled with cold water? Any help appreciated. Thanks! Hello, You can set the butter over a larger Bowl with cold water and stir until cool. Just a few minutes before adding the egg. Hope that helps! I can’t wait to try this recipe! I used the Joy of Cooking recipe twice and they never turned out right, I’m hoping that this recipe will work out, but if it’s Julia Child I’m sure it will! Good to know that there are still some lovers of the delicious little treats I was named after! I also used the Joy of Cooking recipe, probably not in the latest edition, which said to bake at 425 degrees! This seemed too hot, and it was. Hoping they have corrected this now before a lot more people overcook them. Should have paid attention to my doubts. 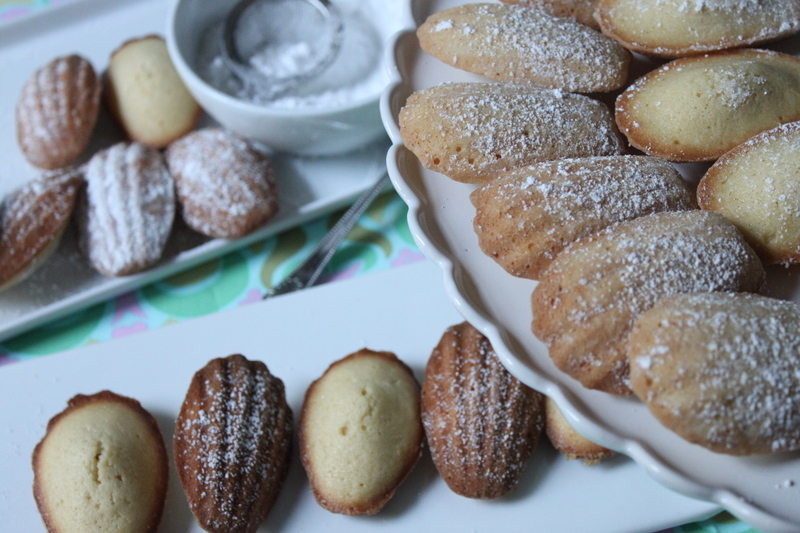 What I find puzzling is that there is so much variation in recipes for madeleines. Different in number of eggs, sugar and flour amount. And the recipe here says mix flour and sugar and add to eggs, which is different from all the others….which say mix eggs and sugar, then add flour. And isn’t it strange that some say barely mix, others say mix a long time. Makes me wonder why there is so much difference of opinion on this subject. And now I don’t know which recipe to follow. Is Joy of Cooking OK except for oven temp, or is the rest of it off too? Don’t want to keep wasting ingredients. easy to do with outstanding results. I added a little coconut to one batch and melted chocolate for dipping – delicious. I have to say, I found this recipe and hesitated to make it because at first glance the steps to make it seemed like a lot and sometimes my brain can’t wrap itself around such a delicate and precise recipe! I even did the first step of mixing the flour and sugar and almost backed out, quickly checking other recipes to see if I could change to a different one…in the end, I followed through with this awesome recipe and they turned out AMAZING!! Way better than I could have imagined. I used to manage a French Bakery in San Francisco and have been dying to make these ever since I left my job there. Thank you for sharing this! They had a perfectly buttery nutty flavor and were moist and not too cakey. I will definitely be making this again! I’m so happy you liked it and, most importantly, that it worked for you! How do you thaw madeleines? I tried thawing some at room temperature, and they didn’t seem to taste the same. these came out better than my first attempt using another recipe. I have a non stick pan so I’ll skip the butter next time (I buttered and floured liek it says and they came out too brown) also I need to be more consistent with the measurement, as some were too small and got crispy. but those that were the right size were delicious, nice small crumb, great texture and flavor.. This recipe has no baking powder, and the eggs are not beaten to light and fluffy. does the batter rise with a hump? Between the batter resting and chilling the hump does rise. Let me know how it works! After my third trial of making these, this is perfect. Certainly does not compare to the Allrecipes version,or the joyofbaking. Delicious,better than starbucks,and I cant stop eating them. thanks for the recipe. If 1/2 tsp of baking powder is added, would they be lighter? I just finished making a batch, which only yielded 18 cookies. They were heavy, crispy, and a bit bitter from the lemon rind (really from half a lemon?). I followed the directions exactly as appeared and used the highest quality ingredients. When mixing the flour, sugar, and egg never was it creamy, always super stiff. My pans were non-stick, so if I decide to try this recipe again I will skip the butter and flour. They’re definitely on the heavy side and made for dunking but I’m so sorry you didn’t enjoy them. Made this recipe for my baking club garden party theme last evening and they were a hit! This was a group of pastry chefs from the Boston area so well-done! I wanted to note that I needed to add a third egg. 2 large brown, cage-free eggs didn’t cut it b/c the batter was way too stiff. Perhaps my eggs are just on the smaller side? In any case, they were so good that I made them again tonight and will probably bring them to my friends in Montreal when we go for a visit later this month. That’s great! I’m so happy it worked out! I do not know how to explain the pleasure and happiness I had experienced when I tasted these madeleines, I eat 28 ounces of these in last two days, I felt like as if I got married to my true love and went on honeymoon. I was waking up in the middle of the night and going for a few madeleines its so hard to resist. And I am well know for my discipline. But It was Love in first bite. thanks for the recipe. your content are running off the screen. Can someone else please provide feedback and let me know if this is happening to them too? I have made these twice last week. The first time they came out tiny and dry so I decided to add a third egg (I used large eggs) . Perfect. Plump, bumpy, crunchy on the outside and moist inside. A hint of lemon and oh the brown butter taste. I have found my husband sneaking down the stairs at midnight to eat one… Or two. They didn’t last through the weekend. Julia knew what she was doing! Back in 1967 or 68 I took off a semester of University to teach myself to cook from Julia’s Mastering the Art of French Cooking. At the end of the semester I had a big dinner to show off all I had learned. Now I understand what I had learned from Julia was formidable. I even made the French bread with steam brick. I think the Madeleines were the first thing I ever made and she recommendd Orange flower water for flavoring. The were delicious. So lucky to have lived during her time. Thank you so much! I followed your instructions to the letter and these are perfect. I am so happy! They are definitely dense but I’d say still fresh up to until the next day. But then I always use them to dunk in tea or coffee so that makes up for a lot. This is THE Madeleine recipe. I followed it exactly, except that I baked them in a convection oven at 350 for 15 minutes. I was a little skeptical at first because the batter seemed way too thick, but I kept stirring, and magically, it loosened up. I was also surprised at how the batter bubbled while it rested. The cookies rose beautifully in the oven and were just perfect! Which of the versions was better? The darker crispier ones or the lighter ones? Oh how delightful. I am sitting enjoying a cup of tea and a gorgeous Madeleine. I followed the recipe except that I used 3 eggs after having read some other comments. It is the first time I have tried to make them and will probably make another batch tomorrow. Thank you so much for sharing. I just did this recipe. And a think I followed it to a ” t” and at the end no bump. They were flat more like a cookie but tasted great. Got 17 out if 24 and for the next time I would put less batter on the pans. This is the second time I made madeleines (1st with the allrecipes’ one and 2nd with this recipe) I’m still figuring the whole baking secret on these delicious little things. I put the batter in the fridge and the greased floured pans in the freezer both for about an hour. By the way also used 3 eggs. I made these for christmas… my friend requested I make these. Never having a madeline before, these were amazing! I dipped some in chocolate with sprinkles and some with peppermint chocolate. I also couldn’t find madeline tins anywhere… i called craft stores, the mall, walmart, bed bath and beyond, ect, they had none in the store. I bought a silicone baking mold in the shape of light bulbs (closest shape to a madeline they had) it had 24 spaces. Came out just as good, perfect substitute shape, and no need to butter the silicone, they popped right out! I got my pans at Kitchen Collection. Some thoughts on humps and ridges. My guess is that the batter was originally baked in cake pans to make cakes. One day a baker, wanting smaller cakes, hit upon using some scallop shells (left over from Coquilles St. Jacques?) since the batter was too thin to just mound on a sheet pan like a cookie. Voila! I’m so happy you’re putting the pans to use already! I had never made these before but have been intrigued by them for years. I finally bought a pan,f ound your recipe, and gave them a try. They turned out just perfect, and I even used gluten-free all purpose flour. I’m on my second batch today in preparation for a dinner party. Thanks so much for a real gem! Good to know gluten free works here! What do I do with the butter and flour set aside? It seems you skipped a step. This recipe is tres magnifique!!!! Exactly what I was looking for. Serving them at a breakfast and I am so excited to see everyone reactions. I love how you have included the brown butter step; the batter smells and tastes heavely. This is a really great recipe. I make it all the time and the clean up is a breeze. I use vanilla bean and they are irresistible. Thank you so much for sharing this recipe. thanks for the recipe! just baked a batch myself and they turned out tres fantastique. madeleine cookies are some of my favorite items to get in france so i’m glad to finally make some myself. hi sofia. i hope you’re still checking this site. thanks for the recipe. it’s excellent. i just have a question regarding using bergamot. do you mean 2 drops of bergamot oil or extract and is that in the original recipe or your variation? i happen to love bergamot and i want to try it using lemon and bergamot. I believe it’s bergamot extract. I went to Paris last month and couldn’t get enough of this lovely treat. Cakey and crisp at the same time, and not too sweet. I can’t wait to try this. Thanks so much for the detailed recipe! THE GHOST IN THE KITCHEN was solved for me by the simplicity of the child sitting at my kitchen table. I served her some fresh made Madeleines with warm cocoa, and mussed “I wonder why they say to put the pretty side down on the plate?” With a smile she said “I know why they put these on the plate like that”. “really?” I asked. she said ever so sweetly ” “Yes, so me and your company will put it in our mouth with the sugar side down, where it touches our tongues, yummmm (she almost purred), or the sugar gets in my cocoa when I dip it” out of the mouths of babes come the wisdom. LOL or the answer that satisfied me. This is it! The madeleine recipe I’ve been searching for, for five years. They are perfect! Where can I find bergamot? I never heard of it except as it appears in Earl Grey tea. I live in Israel, but go to New York sometimes. So excited about this recipe! The batter is resting in the fridge as I write this. I have a good guess about why to serve these with the pretty side down. I am thinking that they were probably served right away, while still a little warm? And in that case, you would want the hump side face up so that the steam could continue to escape. Otherwise, they might become mushy, and not slightly crispy and wonderful. I have had the Madeleine pans for a couple of years but no recipe or time. I tried the recipe along with some of the tips and they turned out great. My husband loves them having never tried them before. I think they might be gone by morning. Thanks! The recipe works beautifully with those adorable humps!!! There is depth in the browned butter taste! Loved it. 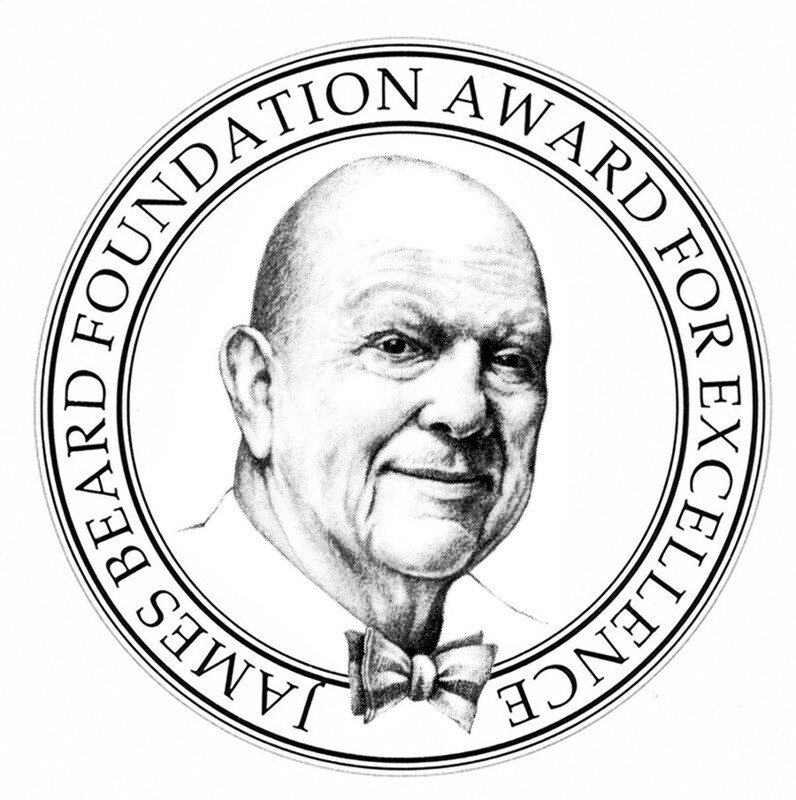 Thanks for excellent & inspiring stories…. Wish I could show you my pictures! I wish could see them but happy you enjoyed them! Madeleines de Commercy | Life.Music.Games.